There was a decent crowd willing to brave the frigid temperatures and wander out to the George Ignatieff Theatre for the Trinity College Dramatic Society’s production of The Frogs. I know I felt kind of bad for dragging my visiting Vancouverite friend out to play the part of my theatre companion for the evening, but he didn’t seem to mind. The Frogs tells the story of Dionysos, God of Wine, Drama and all-around merriment, and how he decides that the state of the world isn’t quite up to par. People are following the status quo, not much independent thought is happening, and he’s looking to do something about it. So he decides to drag his slave, Xanthias, along and venture down into the underworld to bring back one of the canon of english theatre’s most prolific playwrights, George Bernard Shaw. A loose adaptation of the Greek classic by Aristophanes, this version provides a toe-tapping libretto by one of the masters of musicals, Stephen Sondheim. It’s been a while since I’ve seen a university dramatic society production of any kind, and while I will admit to being somewhat wary when bright-eyed undergrads decide to mount musical theatre, I was thoroughly impressed with the talent on display last night. There are some top-quality voices in the production, and it’s especially nice to see the use of a full band as accompaniment. Hidden in plain sight – yes, you read that correctly – downstage behind a large raised scaffolding-like set, the band seemed a little shaky during the overture, but eventually warmed up over the course of the first act and into the second. Generally speaking, the singing was impressive, most notably Andrew Byerlay, who played an exuberant Dionysos and belted like nobody’s business. There were a few moments during the show that some cast members had trouble keeping with their musical cues, and others when the Chorus’s words were all muddled together and difficult to understand, but I imagine this is something that’ll be smoothed out over the course of the run. While the songs weren’t as memorable as some of Sondheim’s other work, I think my favourite solely musical moment was the Chorus’s beautiful harmonization during “It’s Only a Play”. The set is sparse, using only a few large, key set pieces like Charon’s boat and an opulent mantle in Herakles’s lair. Keeping the stage clear for a large part of the show is a wise choice on set designer Anton Ermakov’s, leaving more room for Victoria Hoffman’s fun choreography. I think “The Frogs” number is the most exciting of the show and it’s well-executed, with the Chorus dressed in morph suits leaping strangely about. I didn’t need to read Hoffman’s blurb in the program to know that it was probably the number that was the most fun to put together. Other stand-outs for me were Alyssa Stokvis-Hauer’s Charon, boatman of Hades and stoner extraordinaire, as well as Anthony Botelho in the role of George Bernard Shaw. Botelho’s robust version of the playwright might lose the battle of wit and verse in the context of the show (there’s a verbal sparring episode between Shaw and Shakespeare), but I felt that he eclipses Aaron De Sousa’s Shakespeare on stage, making the Bard’s eventual victory a little unbelievable. Steven Conway’s Xanthias is all twitchy, nervous energy and largely hilarious, but there were a few moments I almost wished he would slow down his delivery a little, play a little bit more with the audience. We were certainly ready for it. The show is a fun foray into classic Greek theatre with the added bonus of some catchy tunes and an enthusiastic cast. The Trinity College Dramatic Society’s The Frogs is a good time and most likely not something you’ll have a chance to see again in the near-future. 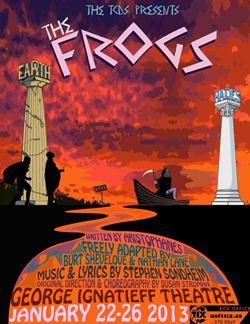 The Frogs is playing through January 26, 2013 at the George Ignatieff Theatre, 15 Devonshire Place, Toronto. Shows run Thursday to Saturday at 8:00 p.m.
Tickets are available online, a limited number of tickets will be available at the door.